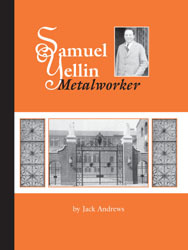 Samuel Yellin was America's greatest artist-blacksmith. He created a vast amount of decorative wrought iron from 1909 until 1940. At one point he employed 268 iron craftsmen who worked in his Philadelphia studio forging a wrought iron legacy for America. This book describes in 168 photographs and text the work of this creative iron master. This is a photographic essay of the master artist-blacksmith Samuel Yellin representing the culmination of 19th-century wrought iron design. At the workshops in Philadelphia (1909-1940) Yellin created wrought iron for major clients throughout the US. The reader is treated to numerous views of the workshops with works in progress. A record of Yellin's works in the form of workshop job cards will help other researchers in locating existing samples of this master's work. We are indebted to Andrews, a blacksmith himself, for undertaking this project to help preserve Yellin's works for future generations.